The U.S. Navy has named the latest Independence-variant littoral combat ship after a city in Texas. Austal USA will construct the future 419-foot-long ship in Mobile, Ala., the service branch said Monday. 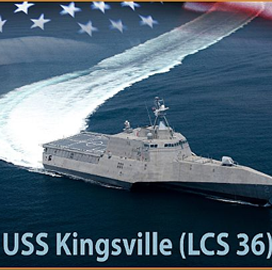 The ship, also known as LCS 36, will feature a 104-foot-long beam and designed to run at speeds of over 40 knots. "The citizens of Kingsville have been steadfast partners to the Navy and Marine Corps team and their enduring support of our future strike fighter pilots have helped make the city of Kingsville the gateway for naval aviators," said Richard Spencer, secretary of the Navy. The Navy has purchased a total of 35 LCS units, with 11 in progress and seven awaiting for construction to start.